In the ever-present quest for perfection, photographers from around the country call me weekly with questions about shooting raw versus jpeg. The debate over this topic has been waging strong on the internet since the advent of digital still-image capture. Creating confusion, every photo blogger and “expert” in the forums has their opinions. Each of them expressing “this is the right choice”. Well today’s post is here to proclaim that it’s mostly bunk. There is no perfect answer that fits every photographer all of the time. The Holy Grail of file type is a myth and it’s time to stop looking for it and get on with the business of taking great images. The two camps in the JPEG versus RAW debate have strong emotional bonds to their “rightness” and are willing to go to great lengths – even as far as to embarrass themselves online while attempting to change the unchangeable minds of the opposing camp. They cling to the strategy of looking for evidence to support their case while ignoring the evidence of the other. In the end it just adds up to more confusion for the reader – who continues to be un-prepared to make their decision. If you are hoping this post will give you the right and perfect set-it-and-forget-it-forever options, you won’t find them, because I don’t think they exist – though you may find one that works for you most of the time. What you will find is unbiased data to help you make educated decisions before you enter a shooting scenario. You will also find enough data to see clearly why I made my bold statements against the “This is always the right way” mentalities. On what standards do your customersdetermine quality of service? How important is color accuracy? How critical is the pixel depth (megapixels)? Is dynamic range an issue? What are your expected turn times from capture to delivery? Are you shooting under controlled lighting and can control scene dynamic range? What is the expected use of the image? Web, press, photographic, pigment, all of them? How large will the file be expected to print? Do you have time for custom white balance? Do you have time to verify exposure settings with a quality hand-held meter? Do you see time as money? Are you paying assistants or digital artists to post-process? Are you paying your lab to color correct for you? What is your present customer satisfaction rate and is there room for improvement? Are you willing to spend some time, effort, and resources to impact product quality? Do you expect your workflow to minimize the post-process impact on margins? If you are a hobbyist, what are you looking to gain? Under what conditions am I shooting? What is your personal criteria for quality? Before choosing your shooting format I recommend you first determine your priorities and make a list. When you know what is important to you, then the best choices can be made and most often with higher levels of confidence. For these examples, we’ll look at the typical requirements of each shooter type. Knowing the requirements will lead to understanding why a certain thing might be a priority. Photographers and business models vary, so results and opinions may differ. For the pro, they have to satisfy an end user in order to make a living. Often working with pro level tools to maximize image quality and speed the process. For some of the professional markets such as studios, time is an expense against the profit margin and customer experience may have the largest impact. For other business models such as fine art, it’s often maximum image quality that is the primary target. Studios are the business model most likely operating in some type of assembly-line type of workflow. They have dozens of images from each person or product shot and each of these files needs some kind of attention. Usually starting with elimination of the unusable, then selection of the prime images followed by editing. The artists that are paid to handle this process are usually compensated by the hour. The longer it takes to move a job through the work-flow, the deeper the cut into the bottom line. Quality needs to be maintained to meet or exceed the customer’s minimum expectations. The average consumer’s expectations are often that the professional print should exceed the quality of a drug-store print. As long as they can see a higher level print, that particular expectation is met (photographic skills such as composition aside for the intent of this discussion). Skin-tones and most all other colors related to people photography fit will inside the sRGB colorspace. Studios have a great deal of control over their lighting, and thus the required dynamic range for the shoot. A good setup can usually hold within a 6 stop limitation of a JPEG work-flow. Interior location photography has additional challenges resulting from ambient conditions that might not be controllable. Office lighting, large windows, etc. can contribute to the overall lighting of a scene and may result in lighting ratios that exceed the 6 stop limit. In profit-centric people photography, merging brackets for HDR is rarely an ideal solution. Commercial product photography has unique demands, especially when the product or person being photographed requires special staging and effects. And yet the images themselves usually end up being used in the lowest of gamut conditions: 4-color press and the internet. In a complex shoot, where lighting, effects such as smoke or movement are in play, bracketing is not an option so maximum dynamic range is beneficial. In table top product photography – think catalog photos – there is no movement, lighting is completely controllable and product colors rarely exceed the basic gamuts of Adobe1998 or sRGB. Since the subject does not move, bracketing can be used to maximize dynamic range.. Food photography brings the potential for highly saturated colors that would do well with a larger gamut and maximum control. A commercial photo session often includes a day or more of styling, prep and active capture, followed by a similar amount of time in post. There are thousands if not ten’s of thousands of dollars at stake and final image quality can be critical to the customer’s end sales. Such diversity creates situations where JPEG would be most profitable and other times where a RAW work-flow is mandated. The fine-art photographer is often most concerned with image quality. They seek an integrity in the image that jpeg does not deliver. Maximum dynamic range, sharpness, color fidelity and detail are all sought in the persute of the ideal print that meets the artist’s vision and the expectations of the descriminating print buyer. Fine art images are often heavily manipulated to create the mood sought by the artist and to bring out maximum detail. Through manipulation, detail along with any compression artifacts will also be brought to greater light. Artists will often use improper white balance to enhance mood and emotional response. The artist will often spend countless hours laboring over pre-planning of a shoot, and many financial resources are spent on models and assistants. The final editing is usually performed by the photographer rather than an assistant. 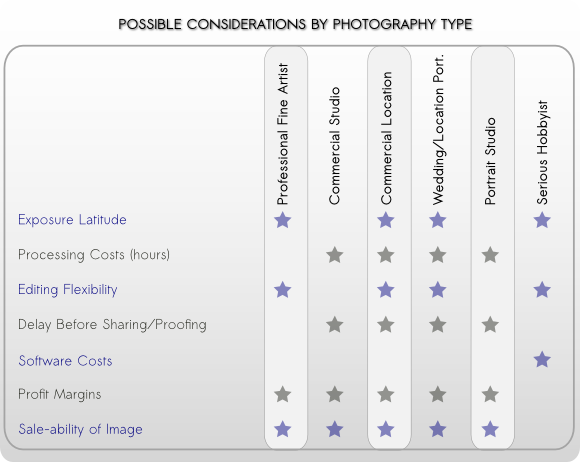 Prepared with the insights you now have into the requirements of a few professional photographer types, these charts should help clarify why one format type won’t properly cover every photographer’s needs, and how some photographer’s might benefit from both types during their day. Can be any working space you have a profile for. WB can be tuned post-capture. Greater exposure latitude – though precise exposure is recommended. Highest level of adjustment flexibility before causing gaps in histogram. Best option if over-sampling is required. Takes the more time and resources to post process. Larger in-camera and offline storage space requirements. Must be processed before online sharing/distribution can occur. Smaller file sizes maximize in-camera and offline storage space. Proper WB and exposure can often go directly to print. Easily shared via email and web with no additional work. Maximum software support both pro and consumer level. Usually limited to sRGB or Adobe1998 at time of capture. Any settings applied in camera i.e. WB, sharpening, noise reduction, etc. are “fixed” into the image – changes require post-capture retouching/editing. Minimal exposure latitude of 1/8 stop. Lossy format means you paid for resolution that you are sacrificing. Typically does not over-sample well due to in-camera sharpening and compression related artifacts. A successful photographer will learn the needs and expectations of their client, then support those needs through technical and artistic know-how, all the while minding the needs of the bottom line. You can help our readers by sharing tidbits you have discovered regarding JPEG and Raw workflows in the comments below. And as always, we are here to answer your questions. Result can be improved by future improvements to processing software. While this can also apply to JPEG, not nearly so much. Excellent point John Stephens. As software improves we can go back to previous raw captures and reprocess them, thus taking advantage of changes and additional features. Do you have examples you can share of when this has applied to you? I am a Lightroom user so general examples would be updating from one process iteration to another and improvement of lens-specific correction information (distortion and chromatic aberration), but the future is fraught with possibilities. Adobe has demonstrated algorithms for minimizing blur, and as phone photo and camera photo technologies converge it would be a shame if the metadata from movement sensors in phones was not applied to a more capable “smart sharpen” function. I imagine color transformation will evolve from the kludge it is now to an intuitive, high-precision, all-inclusive color space (soon) so that iterations of subtle color correction and proofing are made redundant. In a sense, this was true with film, too. There was always more “there there” and you relied on a journeyman team to “interpret” your film to your print needs. Scanners improved and technicians became artists (and they concentrated at Reed) and if you sent your film in for a re-scan you could expect better results. So, to me, RAW images are like film images and JPEG images are like your set of separation films. You could etch the films, but your batter would not change much. Already with updates to process versions I have seen better highlight transitions, more control and better results from my legacy lenses. Look at how much HDR processes from RAW images have improved in the last several years. Thank you for sharing John. There is of course a danger with raw in that the present and the legacy raw formats are proprietary, and they too will change over time with no guarantees that older formats will be supported by new software. Kodak PCD files come to mind for me. A great concept that was abandoned by Kodak just a few years after it’s introduction. Adobe dropped it’s support shortly thereafter. 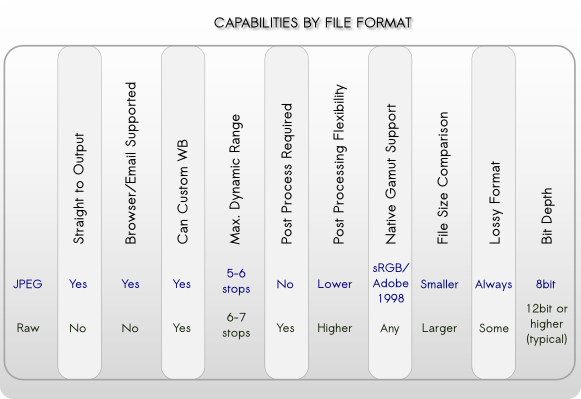 Adobe has been instrumental in the push for a unified Digital Negative file format: DNG but adoption by the manufacturers has been slow with only a handful coming on-board. HDR, or what we used to call “exposure stacking” before tonemapping came into popularity, is certainly simplified through the raw process, though a good exposure bracket series will still improve the process. I love that you mentioned your legacy glass! To this day some of my go-to glass are my pre-auto-focus primes. This evolving formats issue spans all file formats, not excluding JPEGs. I have a great collection of .STN images on 70MB optical disks and a SCSI drive to read them. Given Adobe’s leap to a subscription model I am not putting money on .PSD or .DNG files as future-proof either. I have 3TB of audio files in FLAC format so I recognize that I have a responsibility to move my collection as digital formatting evolves. With imaging I expect the metadata to become more essential than the raster image. For me, though, the salient point is that computers and updateable software are more appropriate for rendering finished images than baked-in in-camera transforms. Storage media will likely evolve at a steady pace, with the unfortunate downside being that all past data will be either migrated to new media, or lost to time. At the rate that we creative professionals generate data, the potential for eventual overwhelm is high. We’ve made some choices regarding what past data was purged rather than migrated, and will continue to do so as we adopt new tech.